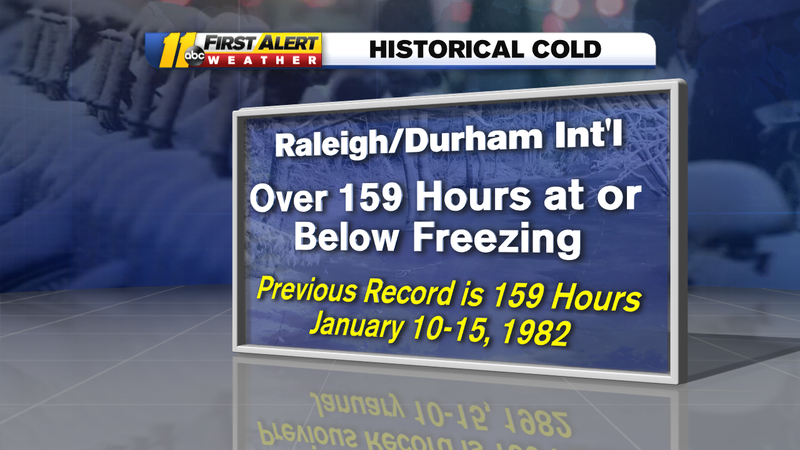 This afternoon around 5 p.m. RDU broke the record for most consecutive days at or below freezing. The previous record was 159 hours set back in 1982 between January 10-15. So far we've spent over 160 hours at or below freezing and we could add even more to this total tomorrow. Right now we're only forecasting a high of 32 degrees at RDU. Our last day above freezing was December 31st at 1:35 a.m. Multiple rounds of arctic air have lead to near record cold across central North Carolina and the northeast since the start of the new year. If you're tired of the cold, relief is on the way. Temperatures next week will warm to the 50s and 60s.